Two Luxury townhouses located at Praia da Luz, a traditional seaside resort in the Western Algarve region of southern Portugal. These spacious three bedroom, three luxury bathroom townhouses are 150 metres from the sea with lovely southern views of the cliffs and sea. Both are beautifully furnished and well equipped. Luz village and it's lovely sandy cove beach are minutes away. Praia da Luz is a lovely picturesque fishing village positioned around a large bay, with a wonderful soft sandy beach. Translated, Praia da Luz means Beach of Light, and dates back to Moorish times when beacons were lit to warn fisherman at sea of the approaching danger from the savage Moors. The Algarve coast of Southern Portugal has a warm and dry climate well suited to both a beach or golf holiday. 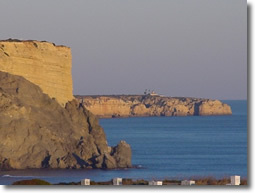 Praia da Luz is on the Western Algarve, near Lagos, just one hours Motorway drive from Faro airport, with flight connections to all of Europe. Come and enjoy the fine sandy beach of Luz bay and the beauty of the Algarve countryside. Take an Algarve holiday today at Moradias do Mar! Click here to view Casa Pedrinho, a large Luxury Villa with beautiful gardens, pool and Jacuzzi at Praia da Luz, in the Western Algarve region of Southern Portugal.